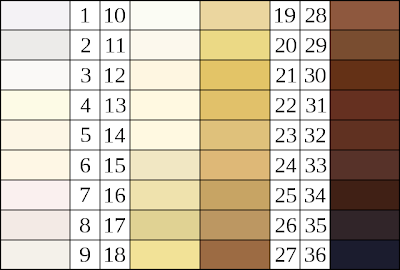 There is a difference between regular skin tones and undertones. Your skintone is the main colour on the top layer of your skin- it can change colour at anytime, through change of weather/climate, embarrassment (blushing) or even by using toning methods such as tanning or bleaching. 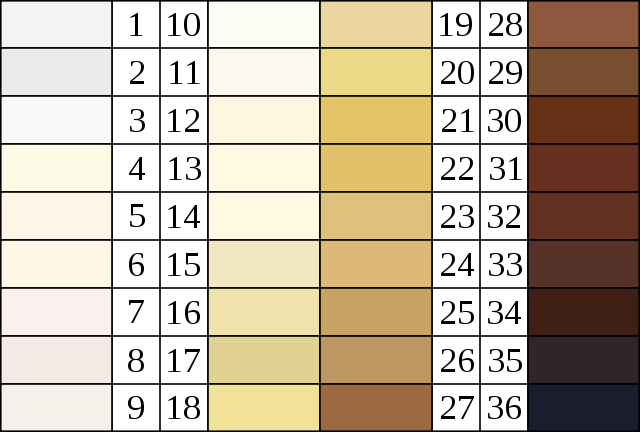 On the chart above are several tones ranging from pale caucasion colours to tanned caucasion colours through to asian completion, light brown afro/caribbean to very dark skinned complexion. Use the chart above to discover what you are. I would be uploading a video on a discussion on discovering the best makeup to use for people with medium to dark skin complexion also showing various examples of makeup that compliments darker skin tones. ALL colours have been mixed with primary colours to produce the secondary colour. In the case of making the colour brown- three primary colours being RED- YELLOW AND BLUE- make brown and by adding more of the darkest colour which is BLUE you get a darker shade brown. Adding less of the colour BLUE and adding more red and yellow can lighten the the shade brown. As a medium to dark skin person, be sure to get makeup with darker colors for example when getting a coral/peach blusher, get a more bluer tone as supposed to getting a redder tone. Lighter tones with red pigment only makes your makeup look ashy on a dark skinned person. The video will soon be uploaded, and with various examples, it will make much more sense. This is a wonderfully informative post! The blogging community needs more peopple like you! You have a wonderful blog! I will definitly return to read more of your posts and I wish you all the luck in the world with it!